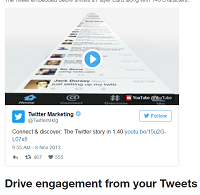 Twitter cards is according to twitter is used to drive more traffic to your website. Have you saw those post on twitter that show a pic and a small description of pic then you click on it and it takes you right to the website? If so that website uses twitter cards. I just started using it myself and some of my adult websites are using it so I can’t show you an example but you can check out twitter’s link by clicking here. What I will tell you is the method I’ve been doing to get traffic on autopilot. It’s not hard at all, but you have to have a wordpress site set up for this to work. The first thing I do is set up an iftt account. It’s fast and it’s free and I love that site. It allows you to almost set up everything on automatic. After I set up my iftt account,I then set up a twitter account, I use a name that is wrapped around my niche. Your niche can be anything, some people like fishing others like hunting, in the adult world use your imagination :). At this point create your wordpress site, niche specific! Now go to the big g and find a niche specific blog feed. Find one that updates regularly, sometimes you might have to add more than one to keep your blog going consistent. Create a new app on ifttt your going to want to make rss >wordpress. I am not going to go in it detail you can google that yourself to using iftt but everytime you get a new item on your iftt, you will post a new item on your wordpress. Now go to wordpress, search and download All In One SEO (all you need is the free version). Go to to “feature manager” and activate “social meta”. You will now see social meta under the All In One SEO tab. You will see” Use AIOSEO Title and Description” check that. You will see down below that, image setting, use first image attached. Go down to twitter settings, in the drop down, I use summary with large images. The twitter site is your @ on twitter and last your twitter domain is the domain you use, if we are using this site, it’s moneywithsmoot.com. After you set all that, click update settings. Now you have twitter cards set up and you have a blog set up on autopilot! Go back to iftt, make an app wordpress to twitter. Don’t do it with images, twitter cards will not work. After you do all that, you have an autopilot blog but you have to have followers on twitter. Just start following people in the same niche. Now if you really want to make money your going to start building an email list, but I am going to leave that part for you to figure out.